One benefit of being the oldest team in Major League Baseball is kicking off the season with Opening Day in Cincinnati! 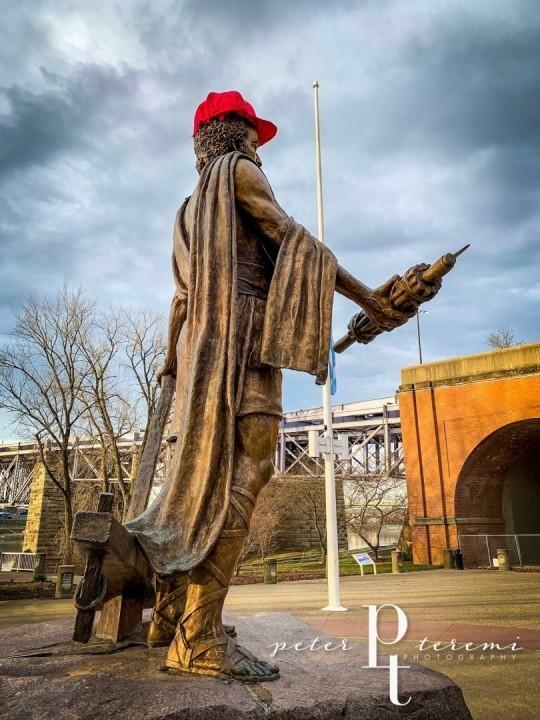 Making our rounds this morning we discovered our bronze statue of Cincinnatus, bedecked with an appropriately sized Reds ball cap. The Roman statesman, for whom the city was named, was born around 519 bce. He served the fledgling Roman Empire from 460 to 439. The day will include a parade, much celebration, food venders, and a game with the Pittsburgh Pirates At 4:10pm. Murphy loves opening day. I am always amazed at how many partially eaten hotdogs make their way onto the ground and into his mouth. Even if I don’t see them, his super power is smelling food on the ground at great distances. Now that the weather has warmed up, there may be more Fauntleroy sightings. Stay tuned! Happy Opening Day Cincinnati from The Murphy-Cam Project!